Haggis is a climbing card game for 2-3 in the same family as Zheng Fen and Big Two. It borrows and recombines elements from its parent games (card combinations, bombs, scoring for cards in hand, scoring for cards collected in tricks) and mixes in equally distributed wild cards and betting that you'll be the first to empty your hand of cards. Sean Ross designed Haggis over a number of years, extensively testing over thousands of hands to create a very engaging and balanced game. Gary Simpson has done a masterful job on the original artwork, that has to be seen to be appreciated. The 2nd Edition of Haggis will feature the highest quality materials you have come to expect from the top "Euro" game publishers. From the thick, linen finished cards, a practical formed insert and thick box, we have choosen the best manufacturers available to produce this (soon to be) classic game. Jeremy's notes: A wonderful Climbing Game from a small publisher. Incredible quality and production values thoughout, which shows what a small publisher can do when they develop their brand with quality components. Haggis is a climbing card game similar to Tichu, but can be played with 2-3 players. The beauty of this game is the ability to play it with only two players… and that’s how I like it best. I want to point out that Indie Boards and Cards have made a habit of taking some traditional games and making them playable with smaller groups… Resistance and Avalon are redesigns of Are you a Werewolf that require no mediator, elimination or large numbers of players to enjoy. I applaud Tom Worthington for this. 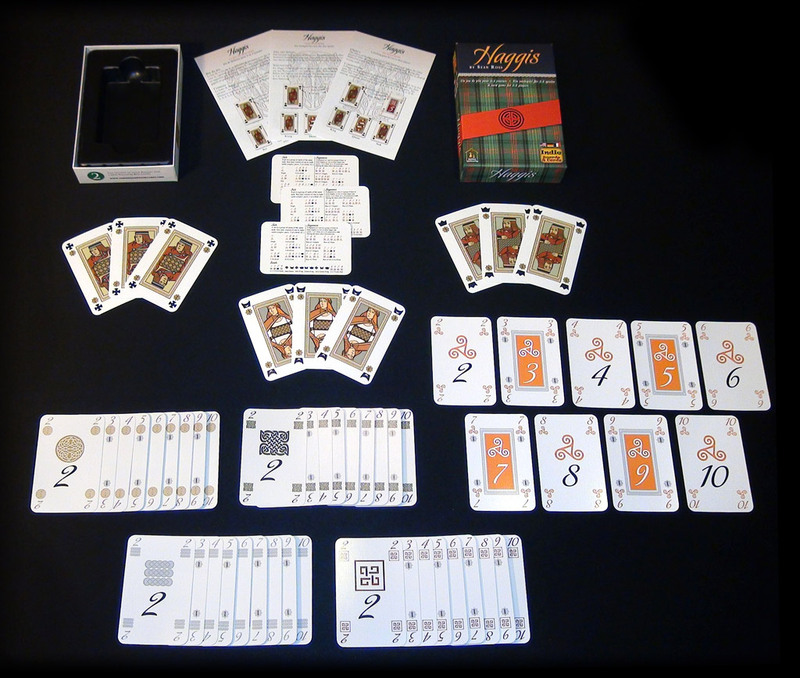 Haggis includes 54 cards in 5 suits (you remove a suit in a 2-player game), numbered from 2-10 with 3 sets of jacks, queens and kings of which you remove one set for the 2-player game. It comes with 3 player aids and rulebooks in several languages. The quality of the box and cards is excellent. It’s really a pretty easy game to play. Each player gets a set of Jack, Queen, and King laid out in front of them. These are wild cards. They are then dealt a hand of 14 cards each. The leftover cards are set aside and not looked at. This is the Haggis… leftover organs for dinner! The stated goal of the game is to be the first to get rid of all your cards. At the beginning of a round, you can bet on whether you will get rid of all your cards first (0, 15 or 30 points). Now, the starting player lays down a set or sequence of cards. These combinations are shown on the player aid. Sets include standard singles, pairs, 3 of a kind, etc. Sequences (or Runs) are like straights in Poker (1,2,3) or can be multiple pairs/sets (2/2, 3/3, or 7/8, 7/8). The second player needs to use the same type of set or sequence but use higher value cards (first player played 2,3,4 , so second player needs to play 3,4,5 or higher). If you can’t beat it… you lose the trick. Remember, you can use one of your wild cards to complete a set or run as well. The winning player puts his/her cards in their pile, and gets to start the next hand. You play again with the cards you still have, and play as many hands as needed before someone runs out. The first person to get rid of their cards gets points for their bet (if any), 5 points for each card the other person still has in their hand (or most cards in 3 player game), and the value of the cards they won in the round. The “losing” player gets all the points from the tricks they’ve won. The “losing” player could very well end up with more points if the “winning” player didn’t bet, and didn’t get as many high cards. You play as many rounds as are needed for a player to get to a predetermined total of 250 or 350 points for the win. NOTE: There are also “Bombs” which are special combinations of cards that end a hand… and this might be used strategically (to lose on purpose). The hand goes to the player who does not play the Bomb. However, you win the trick and get to go first. ALSO NOTE: The player who goes out first gets the Haggis in both 2 and 3 player games. This can be the clincher… especially in the 2 player game. I think it’s one of the best 2-player card games available. It plays well with 3… but I go for other games when I have 3 or more. If you like climbing games like Tichu… Haggis is a no-brainer addition to your arsenal. If you are low on quick 2-player games… give this a try. You can re-purpose a regular set of cards, but, if you like it, I think it’s worth getting the Indie Card box (just in case you want to play with 3). If you are NOT a trick taking fan… don’t bother. I’m a big fan of the game… not the “food”, and I’m glad people are exploring it. Bon Appétit! Do you want a five-suit deck of cards? Then with Haggis you can have it! Well, almost… The Haggis deck indeed contains five suits denoted by colors (silver, golden, orange, red, and green) and different Scottish (Celtic) patterns. Their visual appeal is quite high but the suits are not compatible with ones in standard card decks: there are only numbered cards in; the range goes from 2 to 10, and there are no jacks, queens, kings and aces of these suits. Well, jacks, queens and kings do exist in the set but their cards don’t bear the suit symbols. In fact they are jokers of different values and in the base game they are used as such. The game itself resembles somewhat rummy and poker at first. The players try to form sets (cards of the same value of different suits), sequences (ordered cards of the same suit) and bombs (special combinations of cards). Yet then it starts to differ. The players may bet how many point (at least) they are going to win this round. Successful bets double the points, failures add to opponents score. Finally the starting player plays the first combination and then all the players try to play combinations of the same type but of higher total value. This continues until none of the player wants (or is able!) to play a higher combination or to the moment when one of the players empties their hand. Points for the cards won are then calculated and fulfillment of the bets is checked. I find this game interesting. Interesting and nothing more… But I think that the five-suit deck can well be a basis for a few more games. At least if you have a classic deck of cards you have many games in one. The same applies here! This is a nice niche card game. There are plenty of games that are fun for 2,4 or up to 6 players but very few are designed for smaller game groups. Haggis is a good 3 player one that, more importantly, is designed as a 3 player game. Using a deck that consists of 5 different colored suits the elements will be familiar to those who already play euro style card games. For instance a key element is the “bomb” which allows players to override the current play. I first learned the concept when I was taught Tichu, a german card game, and it is one that adds strategy to the game. If you play cards none of the elements will be hard to learn or master. If you have a friend that has a copy try it out, otherwise, take a chance and buy a copy, I think you’ll like it. If you enjoy trick-taking games and are looking for a good 3-player option, Haggis has you covered. The game might be a bit tricky to pick up unless you’ve played similar games, like Tichu or Gang of Four. Add a Review for "Haggis"